The main body of most fungi is made up of fine, branching, usually colourless threads called hyphae. Each fungus will have vast numbers of these hyphae, all intertwining to make up a tangled web called the mycelium. The mycelium is generally too fine to be seen by the naked eye, except where the hyphae are very closely packed together. The picture on the left was taken through a microscope. The hyphae are magnified 100 times life size. Some fungi, such as Honey Fungus, which is a parasite of woodland trees, have hyphae collected together into long cables, called rhizomorphs. 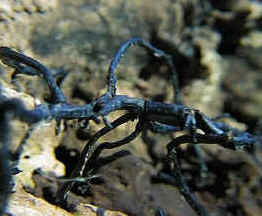 Because there are so many hyphae packed together, they are easily seen, forming black 'bootlaces'. These can spread through a woodland infecting neighboring trees. Fungal mycelium is mostly hidden from human view, not only because of its small size, but also as a result of its location. The tangled mycelial mass is usually hidden deep within its food sources, such as rotting matter in the soil, leaf litter, rotting wood, or dead animals. The mycelium remains undetected until it develops one or more fruiting bodies, containing the reproductive spores. Fruiting bodies (such as mushrooms) are made up of thick collections of hyphae. They vary in size from small and insignificant, to large eye-catching structures. They are usually produced at the surface of the food source, rather than hidden within it, to allow the spores to be shed and carried away by the wind, or by water, or animals. The fruiting bodies are usually the only indication we have that a fungus is present. 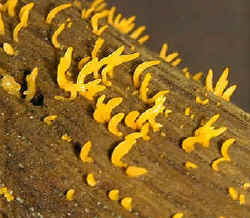 Like icebergs, they represent a tiny fraction of the whole fungus, with most of it being hidden from view. If you are looking for fungi in Britain, the best time to look is in the autumn. The fungal mycelia have then had a long, relatively warm period to grow extensively over the summer. With the coming of wetter weather in the autumn, damp warm conditions are created which are ideal for fungi to fruit. Many fungi have fruiting seasons in late summer to autumn. However, don't ignore the Spring. This is a good time to look for fungi such as Morels and other cup fungi. Little will be found in cold winter months with frosts, although Oyster mushrooms will continue to grow through most of the winter, as will Jew's Ear. Fungal mycelia tend to grow in more or less circular shapes. This is because they grow by spreading out in all directions from a central point. This central point represents the location of the original spore which germinated to start the fungal mycelium. The mycelium will usually produce fruiting bodies on its outer edge. As a result, the fruiting bodies of fungi living hidden in the soil can sometimes be found in rings - the 'fairy rings' of children's stories. The Clouded Agaric toadstool (right) is a good example of this. The fruiting bodies can often be found in rings, because they are produced on the outer growing edge of the circular, underground mycelium. 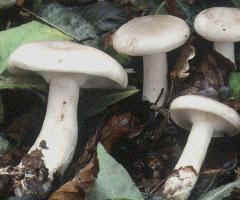 The Clouded Agaric can be found in the leaf litter of both coniferous and deciduous woodland. Another example is the 'Fairy Ring Toadstool' (Its scientific name is Marasmius oreades). This, in contrast to the Clouded Agaric, grows on grassy expanses such as lawns and golf courses. The fungus can be traced by the rings of dark green grass, with the mushrooms fruiting on the outer edge of the ring. The growth of the ring can be traced year on year. If there are no barriers, rings may grow outwards at up to 20 cm per year. This is a fungus which fruits early in the year, in the spring. Most people, if asked to name the largest organism on earth, come up with examples such as elephants, blue whales or giant trees, such as Redwoods. 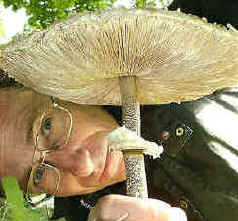 In fact, the largest living organism on this planet may well be a fungus! Some of the oldest living organisms? We tend to think of fungi as being short-lived, because the visible fruiting bodies which we see don't usually last very long. However, for the fungus to have reached this size, it must have been at least 2,400 years old. It would have been a mere youngster of 400 years old, at the time of Christ's birth. The rings of Fairy Ring Toadstools found closer to home in Britain, possibly on your back lawn, can also grow to hundreds of meters in diameter, when they are likely to be at least a thousand years old. Some lichens, which are a partnership between a fungus and an alga, have been estimated to be around 9000 years old! Next time you find several fruiting bodies of one type of fungus growing on the ground, see if you can follow around in a circle and locate any more. The size of the circle will give you some indication of the size of the mycelium hidden beneath your feet. Bear in mind when you do this, that the fungus which is fruiting, will not be the only fungus hidden down there in the soil. In fact the ground beneath your feet will be absolutely seething with the mycelia of different fungi. We remain totally unaware of their presence simply because we can't see them.